I've whinged about it multiple times in the past (see here and here), but the number one misunderstanding that most people seem to have about biodiversity is how much we know about it. Only a relatively small fraction - possibly less than 10% - of the world's species have been described. Corrolary to that is the idea that new species are only discovered in exotic, far-off lands, wonders of darkest Africa and hidden Himalayan Shangri-La. Well yes, doubtless those places do harbour their fair share of undescribed species, but sometimes new species can be discovered right on civilisation's doorstep (by which, being the parochial types we are, we mean Western civilisation, of course). Even more amazing, I hear from Benny Bleiman that not one, not two, not even three, but no less than 57 new species of fish have been identified in a survey of Europe! Benny has the audacity to call this discovery boring, but the idea that there could be so many species yet to be discovered in the very continent that invented the whole concept of scientific taxonomy is just completely mind-blowing! Chester, T., W. Armstrong & K. Madore. 2007. 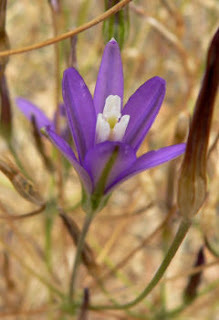 Brodiaea santarosae (Themidaceae), a new rare species from the Santa Rosa Basalt area of the Santa Ana Mountains of southern California. Madroño 54 (2): 187-198. I also have the audacity to say that Diet Dr. Pepper now tastes more like regular Dr. Pepper. How does that sit with you? I don't believe I've ever encountered either. Here in Australia and New Zealand, pepper is not a drink.